As a teacher of mostly teenage boys, I can say my kids want to see three things: something on fire, something crashing, or something flying (and then crashing). I love teaching middle-school science because I get to teach motion, which sets things crashing and stuff flying. As written by Jim Steinman and sung by Mr. Loaf, two out of three ain’t bad. So how do I go from standards to a project idea to a curriculum unit? After the jump, I’ll expand on each of these points and share some of my curriculum planning tools. Come on in and see how the engine of a classroom might work. 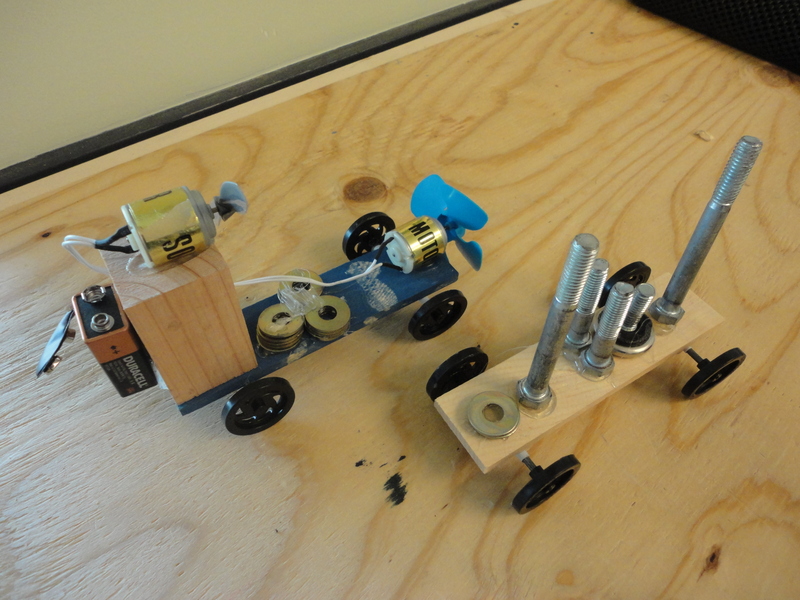 Essential Question: How can I increase a derby car’s velocity? Proven: adding force (motors) to an object’s motion increases it’s acceleration and velocity. I enjoy the process of reviewing, evaluating and rethinking my teaching process to reflect new and evolving pedagogy, only a small portion of which means analyzing standards. This analysis allows me to strive for an academic outcome while teaching in a therapeutic-centric model. There is an art to picking which standards to focus my energy into. I choose standards based on my student’s individual strengths and needs inside the classroom. For my middle-school aged physical sciences class, I grouped PS2.1, PS2.2 and PS2.4 into a semester-long unit I called “Motion & Forces”. Now, I needed to find projects which would interest my students. 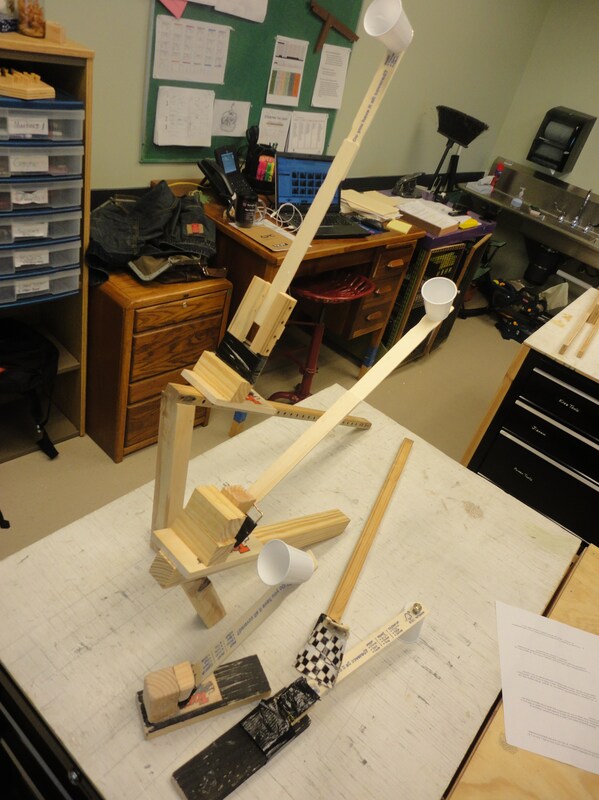 An early prototype: Can we build a working catapult? 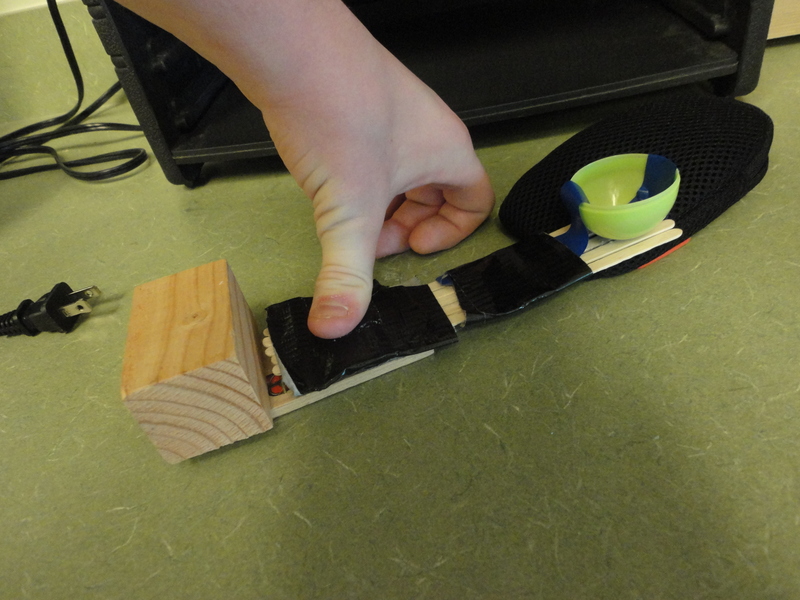 This is a great lab for explaining the parts of a catapult. Choosing, thinking, reflecting and sorting possible projects should be a career-long process. Good projects don’t fade with time, they get richer and more exciting both for the teacher and student. At Thomas Jefferson High School for Science and Technology, a teacher spent 8 years working with students to launch a satellite into space. A project of this caliber has everything it need to be successful – expertise, time and resources. Using a such resources such as Make Magazine, Instructables.com and other websites as brain-fodder, I narrow down my choices. My own expertise runs to physical things: mechanics and linkages, wood and steel. I can’t yet support a classroom of learners in complex electronics and my suggested projects tend to run to my strengths. Next, I usually have an idea of how long I need a project to last. In the context of middle-school, I find the act of tinkering and modification as reflective of learning as the completion of a project, so I want a project which can be built and modified in a reasonable amount of time. I want simple projects with lots of flexibility. Lastly, I need the right resources and tools. My makerspace is chockful of strange objects and materials. For projects I can’t immediately put into action with materials I have on hand, I have to build in a lead-time and budget. A good example of this experience is my 3D printer project (order in Sept., have the students research and write a proposal, bring out in 2nd quarter when it comes in). 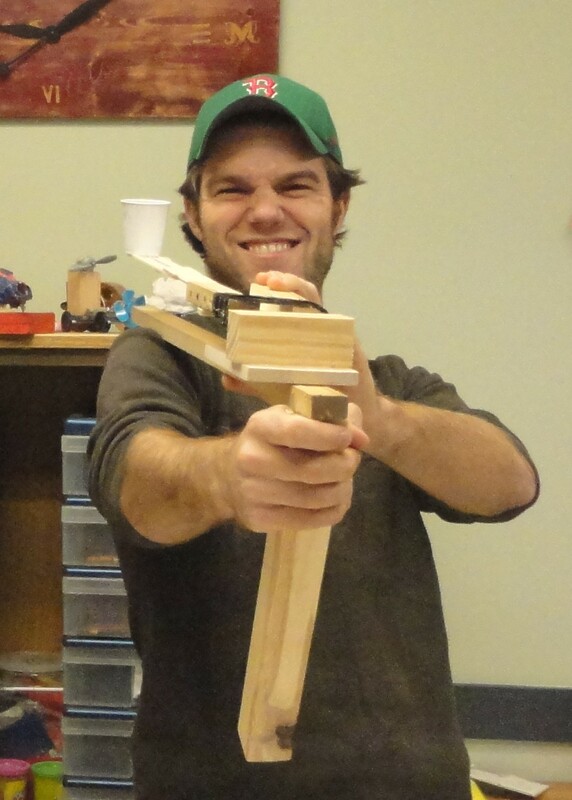 For my middle school physics class, derby cars and catapults matched all criteria. About four to five generations of catapults on display. Essential questions can take up an entire book or blog post in themselves. Essential questions, in teaching circles, means a question which has no easy answer: How can I make the fastest derby car? What makes a powerful catapult? 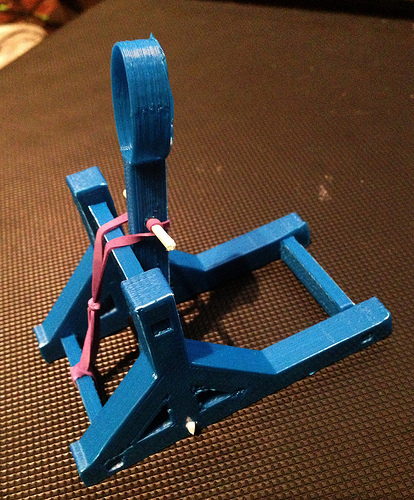 What’s the best catapult design? I often go through this process with the students, having them list their questions and setting them off to find answers on from a myriad of sources. The students help me out by revealing their previous knowledge and their needs at this stage. The teacher also gets the chance to scale their project up or down in complexity to match her students’ needs. I often use this stage to differentiate my learning outcomes. Student’s in group A might build more complex version of the project, or have higher developmental standards in their project, while student B may just cover the basics and become familiar with project-based learning. The two groups move independently and interdependently through our daily assignments. This stage is crucial for logistics and lesson planning – once the kids tell you what they need, it becomes a less of a daily race to fulfill lesson plans and more of a daily quest to document your students’ growing capabilities. With our derby cars, “how do we make a derby car travel faster?” turned into “does mass increase the car’s velocity?” and into “does a motor increase a car’s velocity compared to mass?” and a whole host of things. In catapults “What are the most important parts of a catapult” led to “how does the catapult’s arm effect distance? The release angle? The force of the mechanism?”, etc. 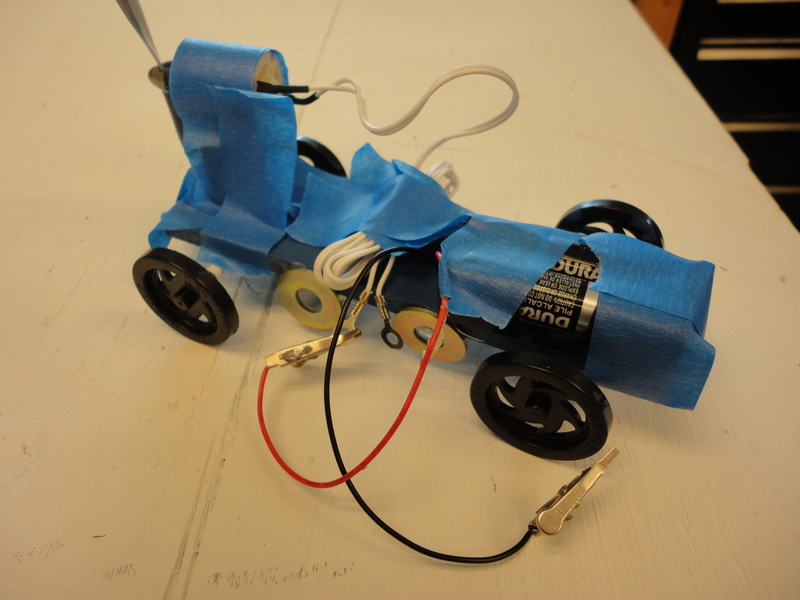 The second iteration of a motorized derby car. Fyi: two motors work better than one. Once I’ve ironed out our essential, and guiding questions, I start looking for cross-curriculum opportunities. I repeat the first two steps while looking at the chosen project through a mathematics, ELA or engineering lens. I’ve hyper-linked to the various standards we use at my school, and I’m sure you have your own to look at. I try to find a colleague in my school to provide me guidance in delivering this wider instruction. I chase down community partners, such as local makerspaces, scientific organizations, etc. I’ve found Twitter indispensable in my quest to connect to other educators with similar lines of work. With these resources lined up, I start working on ways to open these lines of communication and expertise into the classroom. It’s hard work and sometimes fruitless. Good projects require failure at some level. The kids watch this failure and learn from it: everyone fails at some point, but it’s how you get back up that matters. Great projects can teach a student grit, but you have to model it yourself first. Finally, I can start thinking about individual lessons. After three years of working as a project-based teacher, I have built three frameworks for my student’s projects. The first is most useful for middle school students in week-long to two week-long lab projects and you can get it here. I use the scientific method as a framework for their projects. Once I get to this stage, I can set up smaller essential questions, such as “How does the arm length effect the distance of a catapult shot?”, and use these smaller questions to build to a monster “Can I make a catapult which shoots a marshmallow over 30 ft using these materials?”. These small labs take very little build time, often reuse materials and allow for a gradual building and exploration of knowledge by my students. Good preview and reflection cycles allow me space to introduce and reinforce the standards and allow me space have my students download some information. I often use blogging as an online reference for my students mastery. My high school system builds on my middle school work and borrows heavily from the “Big 6” (actually, it steals it outright) so I won’t be posting it here. This year, I designed an alternative to the scientific method for students in my fabrication classes. These classes (such as 3D Printing/CAD) are less about covering new material than integrating current knowledge and practicing their inquiry skills. As such, we expanded DesignMakeTeach’s Mini-Maker Notebook into a six page notebook which can be used to frame an individual learners.